January 26, 2016 By Andre Panagos M.D. #1 Regenerative injection therapy (RIT) has been in clinical use for over a century. A form of regenerative injection therapy was used as a hernia treatment in the early 19th century by Dr. Jaynes in Louisiana (Rice, 1936). In the 1950s, George S. Hackett M.D. developed a form of regenerative injection therapy that he termed “prolotherapy”. He found it very successful for the treatment of ligament laxity leading to other musculoskeletal conditions (Hackett, 2008). 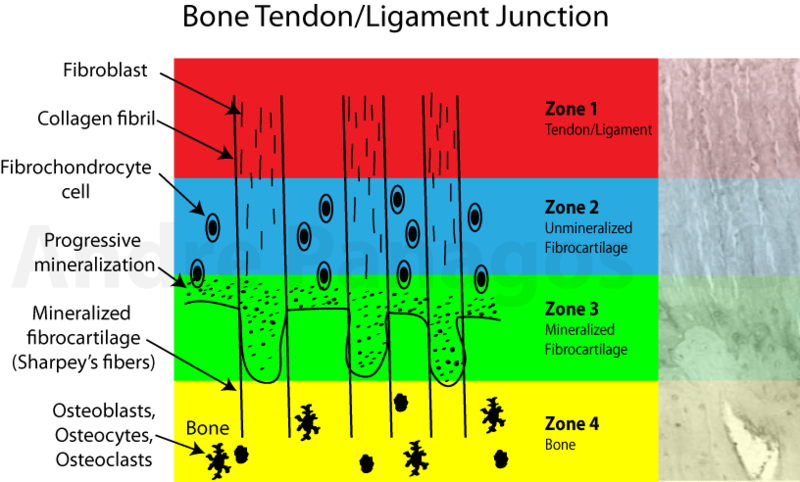 His focus was on injuries of the tendon as it inserted into the bone (enthesis) and of ligaments that inserted into the bone (fibro-osseous junction) (Zone 3 in the figure below). The bone tendon and ligament junction is the most common site of injury due to the significant differences in material characteristics between solid bony tissue and flexible tendon/ligament tissues. #2 Regenerative injection therapy heals injuries that lead to arthritis later in life. With advances in technology, there has also been a great deal of research done on joint and cartilage injuries. Regenerative solutions have been used to begin the regeneration of tissues. These solutions include hyperosmolar dextrose or mannitol, platelet-derived growth factors and mesenchymal stem cells (Hauser, 2014; DeChellis, 2011). Once injected, these solutions restart your body’s natural healing cascade which promotes the growth of normal cells and tissues. Regenerative injection therapy is often done with one or more treatment sessions (Distel, 2011; Rabago, 2010; 2013). 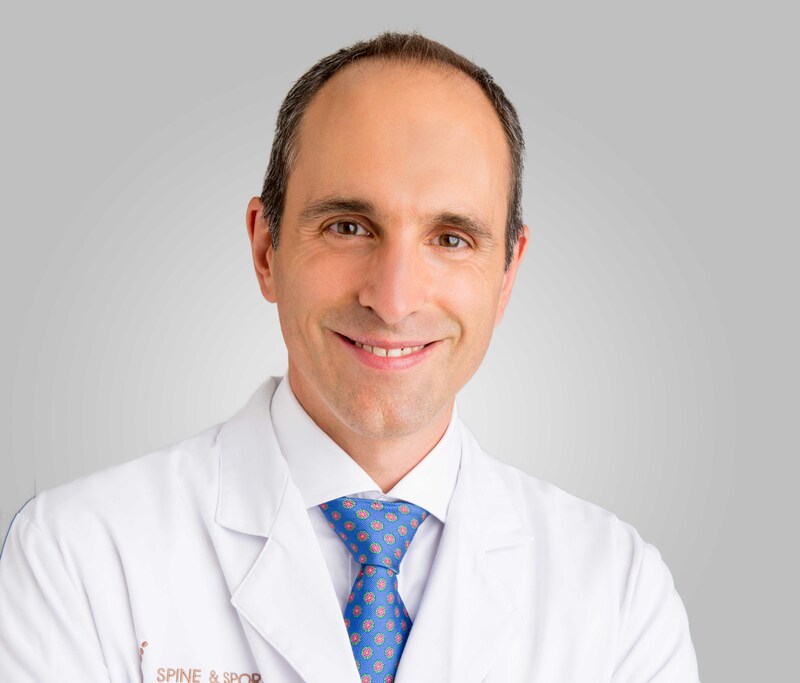 The end point of treatment is the elimination of joint instability, progressive joint degeneration and pain. Clinically it has been observed that once joint stability is restored, pain and muscle spasms resolve with a return of normal functional biomechanics. #3 Identifying the source of pain can speed up treatment. Fluoroscopic or ultrasound-guidance can be used to identify the precise tissue defect that is the source of the pain. Tissue defects can be found even if x-rays and MRIs are absolutely normal. If accurate anatomic localization is difficult, several sessions are usually needed to identify the precise pain generator. #4 Regenerative injection therapy can treat many chronic and difficult to treat injuries. #5 Regenerative injection therapy repairs tissues. Regenerative injection therapy is the only treatment available for the repair of ligament and tendon injuries (Anitua, 2004;Krampera, 2006; Lam, 2003; Liu, 1983; Reeves, 1995). This reverses the abnormal stress on the joint that can lead to future osteoarthritis and pain. Regenerative injection therapy can also be used if extensive surgery, such as rotator cuff repair, ACL repair, or joint replacement surgery have not been completely successful. 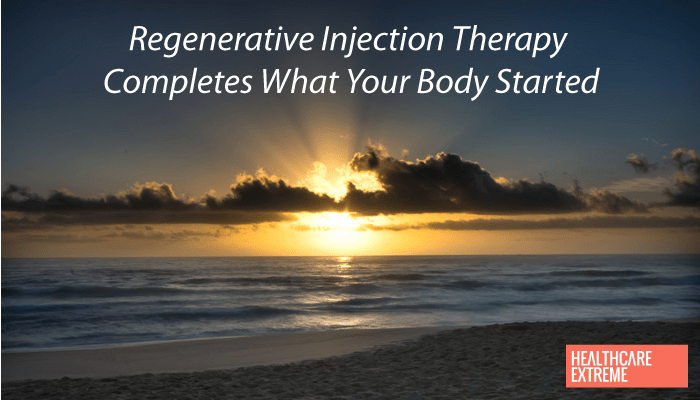 #7 Regenerative injection therapy can work many years after an injury or accident. The duration of injury does not limit the effectiveness of regenerative injection therapy. A successful treatment is possible even decades after the original injury. Bracing, physical therapy, kinesio taping, and activity modifications can also be helpful, but they do not heal long damaged tissues. Oral medications and corticosteroid injections inhibit or delay the healing cascade which helps with pain but do not heal the underlying tissue injury. Anitua E, Andia I, Ardanza B, Nurden P, Nurden AT. Autologous platelets as a source of proteins for healing and tissue regeneration. Thromb Haemost 2004;91(1):4–15. DeChellis DM, Cortazzo MH. Regenerative medicine in the field of pain medicine: Prolotherapy, platelet-rich plasma therapy, and stem cell therapy. Tech Reg Anesth Pain Manag 2011; 15: 74-80. Distel LM, Best TM. Prolotherapy: A clinical review of its role in treating chronic musculoskeletal pain. PM R 2011; 3: S78-81. Hackett G, Hemwall G, Montgomery G. Ligament and tendon relaxation treated by prolotherapy. 5th ed. Madison, WI:Hackett Hemwall Foundation 2008. Hauser RA, Blakemore PJ, Wang J and Steilen D. Structural Basis of Joint Instability as Cause for Chronic Musculoskeletal Pain and Its Successful Treatment with Regenerative Injection Therapy (Prolotherapy). The Open Pain Journal, 2014; 7: 9-22. Krampera M, Pizzolo G, Aprili G, Franchini M. Mesenchymal stem cells for bone, cartilage, tendon and skeletal muscle repair. Bone. 2006;39(4):678- 683. Lam S, van der Geest RN, Verhagen NA, et al. Connective tissue growth factor and IGF-1 are produced by human renal fibroblasts and cooperate in the induction of collagen production by high glucose. Diabetes 2003; 52: 2975-83. Reeves KD. Prolotherapy: Present and Future Applications in Soft-Tissue Pain and Disability. Injection Techniques: Principles and Practice. Physical Medicine and Rehabilitation Clinics of North America. November 1995. (6)4:917-923. Rice CO, Mattson H. Histologic Changes in the Tissue of Man and Animals Following the Injection of Irritating Solutions Intended for the Cure of Hernias. Ill. Med. J. 1936;70: 271-278.